After Carla’s husband was killed in Iraq, Carla moves to Ivy, a small Georgia beach town, with her five year old daughter. Hoping for a fresh start and healing of her heart, Carla and Missy enjoy their first few months playing in the waves, building sand castles, and their new home. Suddenly their world changes. Anger was a huge part of my survival but the Lord showed me, many years later, I don’t have to live with anger. He will heal our anger if we allow Him to. Initially, victims may have difficulty “finding” their anger about this. They will frequently rationalize the actions of their abusers – minimizing the harm done, and blaming themselves for events (though without cause). So many of our behaviors, attitudes, and strongholds are due to events we experienced in the past. Christ came to give us abundant life and He is our Healer. May we all become aware of what is happening to our children. Child sexual abuse is a growing problem today with many children getting sexually abused by the same people who should be loving them, protecting them, and nurturing them. 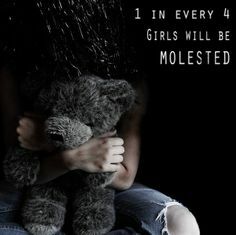 Too much abuse goes on behind closed doors in homes where the children should feel safe. The majority of cases go unreported while the child carries the guilt and shame alone with the weight of this burden which they were not meant to carry. We have to stop the silence so that we can stop the violence. Journaling is a very important part of the healing process. Relate: Ben Franklin had one. Thomas Jefferson did it. So did Christopher Columbus. Among many political greats, we could name the British Prime Minister Winston Churchill, American Presidents Teddy Roosevelt and Ronald Reagan as well as the greatest UN Secretary General ever: Dag Hammarskjöld. Since I am making a list, I might as well throw in some theological giants like Dietrich Bonhoeffer, John Wesley, and Søren Kierkegaard. I could go on and on building this list with famous and successful people. My guess would be that at least half of the greatest and most successful individuals of pretty much any field keep one of some sorts or another. That said, probably the most famous journal of all time belongs to a young girl who is only famous because of it. Of course, that would be the Diary of Anne Frank. It’s a hot summer day in 1934. I want to go out to play but my mother tells me to stay inside. “Stay inside and don’t go out, no matter what,” she says sternly. I don’t understand why she won’t let me go play, but with a stern look in my direction, she leaves the house taking my siblings with her. I stand watching her and the others leave wondering why I was the one left home. “I must be in the way,” and tears begin to flow down my cheeks. I do just what Mother said and stay inside. Standing by the window watching the children from the neighborhood playing in the street I silently shed tears. The day passes. It soon gets dark and I find there are no lights in the house. I get even more scared so I huddle in the corner. I realize I’m not only alone and scared, but I’m awfully hungry, too. I finally fall asleep and when I awaken the next morning sunshine is shining brightly through the window. Mother and the others still have not returned and I begin to cry again. I cry while sitting in the corner and there’s where I’ve stayed for most of that day. Two days pass and finally there’s a knock on the door. Opening the door with caution, yet feeling hope that it’s my mother, I see standing there a neighbor. “Why are you crying? Where’s your family?” she asks me. Between sobs I tell her my mother and the kids left and they haven’t come back. “She’s been gone for two whole days now,” I sob. “You wait right here and I’ll go get you something to eat,” she says. She leaves and a few minutes later returns with some bread. I don’t know it but she had also called the Family and Child Services. The next knock on the door is a nice lady that has come to take me to a home. She say’s there are a lot of kids and I’ll have plenty of kids to play with, food, and be safe. When we get to the home there are a lot of kids! Kids, like me, that no longer have family or a home. The people in the office start asking me a bunch of questions. I try to answer them as best I can but at four years old I don’t know much. I tell the nice lady that’s asking me all the questions that “everybody left me yesterday. I was really scared and boy did I get hungry.” She smiled and tells me I will have plenty of food and a nice bed to sleep in. Remembering the hours in my corner at home, alone, scared, and hungry, I say a silent prayer thanking God for the neighbor that knocked on the door. I also remember the pain. The awful pain. Pain of hunger, pain of being left alone. Pains that never seem to go away. It didn’t take me long to learn to like my new home. I felt accepted because the other kids were like me. By now I think I’m five years old and I lived there with the other children until I was ten. Then I was taken into a foster home. I had plenty of food, a warm bed, and got to go to school. When I left school I was expected to come straight home and work. But that was okay, too. The people were nice and even though the kids were verbally mean I liked it. Between school and chores I didn’t have much time to play. That was okay, too. I would go to the library and check out books. I loved to read and I found escape through the characters in the books. I’d suddenly find myself imagining myself as one of the characters and before I knew it, it was bed time. I graduated from high school and even though I was encouraged to go into the service, I didn’t. Instead I dated a sixteen year old girl and also started drinking alcohol. By now I wasn’t the quiet, fearful little boy anymore. I bounced around from job to job, bar to bar, and ended up getting married at nineteen. I thought I knew it all. I guess I was trying to forget the past. Those days that I was left alone, scared, and hungry. The pain was still there. The awful pain had not left me. No matter what I did I still felt the hunger pains. Three children, a wife, and the pain. What a disaster! We finally divorced. I continued to drink up most of the salary I made from the job I had. I had never learned to manage money, which added to my problems. This went on for several years. Then by sheer chance, (or was it?) I met the lady of my life. I don’t know what she saw in me but I fell in love almost immediately. We got married about a year later and the change in my life was evident to all. I don’t know how she did it but I changed completely. When we got married I was still feeling the hunger pains. The hunger was not just for food by now, either. I was hungry for love, family, a good life. But the awful hunger pains still rattled through my soul. My wife did all the cooking. She made sure we had plenty of food in the house. We always had a good meal. She took over the finances so I wouldn’t mess up everything. And we began saving money to buy a house. We both worked and saved. It took a long time and a lot of hard work but we got the house. I couldn’t believe it! My own home and a loving and caring wife to share it with me. Suddenly I realized, no pain. No hunger pains lingered. At last I was free. My soul had been healed and filled. Thank you, Lord. You were there all along. Posted in Uncategorized and tagged acceptance, Child welfare, Family and Child Services, Food, Foster home, Hunger, Lft alone, Lord Jesus, Testimony. Bookmark the permalink.